PUNK: Chaos to Couture, the theme of last week’s Costume Institute Gala at The Met, transported everyone back to 1977, when punk was alive and kicking. Exhibits feature some of the most nostalgic highlights from the rebel movement. Guests were treated to edgy fashion displays from Versace to Vivienne Westwood. Even an exact replica of one of the bathrooms at CBGB, the New York nightclub famous for being one of the first places to embrace punk, was featured. The event also had an incredible 16-foot-high LED screen, on display, showing punks in a mosh pit, pogo-ing to music from A Clockwork Orange. Many attendees took the theme as an opportunity to let their inner punk roam free, by strutting the red carpet in safety pins, studs and leather, while others took it to the extreme. Anne Hathaway and Nicole Richie displayed new edgy do’s, while Sarah Jessica Parker donned a mohawk headpiece by Philip Tracey and equally fashion-forward dress by Giles Deacon. Beyoncé, the night’s honorary chair, arrived in a daring strapless corseted dress by Givenchy and Miley Cyrus showed no fear in a sheer mesh dress by Marc Jacobs. Legendary punks, like Debbie Harry and Madonna, who wore a jaw-dropping outfit by Givenchy Haute Couture, were also in attendance. 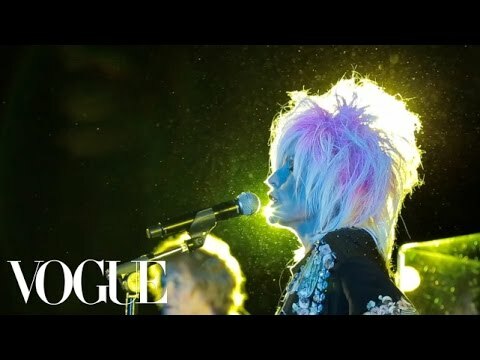 To give us a taste of what took place at this years gala, Vogue put together a great behind-the-scenes video. It captures the fun and rebellious mood of the event, with some of our favorite celebs chatting it up and dancing the night away to a never-before-seen performance by Blondie. PUNK: Chaos to Couture will run through to August 14, 2013. The exhibit showcases punk’s origins in London and New York, displaying its impact on high fashion and how it’s influencing designs today.